Ever wondered what to buy the person who has everything? Have a few (hundred) thousand dollars to spare? Moda Operandi have the answer. Moda Operandi have become our go to shop for sought-after designer collections straight off the runway, in fact we get so excited when our exclusive trunk shows are live we practically all over our virtual cyber feet scrambling to log in before anyone else. Now, they are bringing us a very special curated selection of the very finest luxury devices. This takes gift buying to a whole new level (and price bracket). Have you ever heard your loved one pipe up and say that their life would be complete if only they had a 24-carat gold Nikon camera? Unfortunately, mine has. Now their prayers are answered. 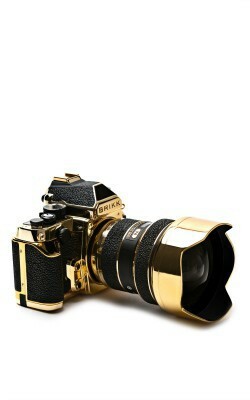 Brikk, the couture accessory brand has created a range of iWatches and a coveted Nikon camera that comes n 24-carat gold and stingray leather. Keen not to be left out Goldgenie has also introduced an exclusive (sensing a pattern here) range of iPhones and iPads in gold, diamonds, and mother of pearl. Technology is rapidly becoming as much a part of your overall style as the clothes you wear and what better way get noticed by making the ultimate luxury statement. You can even engrave your items to add that extra personalization and to stop wandering hands presumably. These items, available at Moda Operandi really are the ultimate extravagance for the tech-savvy amongst us. Our personal favourite has to be Goldgenie’s platinum encased diamond encrusted iPhone 6 for a mere $13,495. We’ll take two.